Hyundai Heavy Industries Co., the world?s largest shipbuilder, and two South Korean competitors will raise steel purchases by at least 11 percent. Hyundai Heavy Industries Co., the world"s largest shipbuilder, and two South Korean competitors will raise steel purchases by at least 11 percent. Hyundai Heavy Industries Co., the world"s largest shipbuilder, and two South Korean competitors will raise steel purchases by at least 11 percent to a record, bolstering Asian steelmakers reeling from the global recession. Hyundai, Samsung Heavy Industries Co. and Daewoo Shipbuilding & Marine Engineering Co. will buy at least 7.8 million metric tons of steel plates to make ship hulls this year, the world"s three largest yards said in interviews. The Korean orders may support earnings at Asian steelmakers including China"s Baoshan Iron & Steel Co. and Dongkuk Steel Mill Co., as demand from carmakers and builders dropped. Japan"s Nippon Steel Corp. may double planned output cuts amid the recession, executives said today. ?Demand from shipyards is basically the only bright spot for steelmakers this year because supply still lags demand,? Kim Yong Soo, an analyst at SK Securities Co., said in Seoul. ?For shipbuilders, it"s going to mean higher costs.? Baoshan Steel, China"s largest mill, rebounded from a loss to close 0.6 percent higher at 4.95 yuan in Shanghai trading. Hyundai Heavy fell 2.4 percent to 219,500 won and Samsung Heavy slipped 0.6 percent in Seoul trading. Steel is the single biggest material cost for shipyards. Plate prices in China, the largest steel producing nation, dropped 26 percent last year as smaller shipyards struggled to fulfill contracts. Samsung Heavy plans to increase steel purchases 20 percent to 1.8 million tons, spokesman I. Chan Hwang said. Daewoo Shipbuilding will buy 2 million tons this year, 33 percent more than last year, according to an e-mailed statement. Hyundai Heavy, will buy more than the 4 million tons ordered in 2008, said spokesman Kim Ki Young, without specifying the number. ?Demand for the steel material by shipyards will remain strong until next year because of the backlogs,? said Song Sang Hoon, an analyst at Kyobo Securities Co. in Seoul. The Korean yards are fulfilling orders won in 2006. Ulsan- based Hyundai, Seoul-based Samsung and Daewoo said they will buy from Asian companies, including Posco and Dongkuk Steel, which gets half its sales from plates. Baoshan last month said it will raise capacity for plates by 29 percent. The Shanghai-based company supplies Hyundai Heavy and Samsung Heavy. Falling demand may force Europe"s ArcelorMittal and ThyssenKrupp AG to write down as much as $6.09 billion, Tim Huff, a Royal Bank of Scotland Group Plc analyst, wrote Jan. 6. Nippon Steel, the world"s second-largest maker, may double output cuts by closing a furnace, executives said today. Daewoo Shipbuilding said on Jan. 5 that it expects to post record sales of more than 13 trillion won ($9.7 billion) this year. 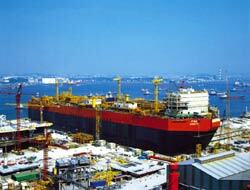 Hyundai Heavy and Daewoo Shipbuilding have yet to announce their business plans. The three yards, with $135 billion of contracts for vessels and deep-sea platforms, are maintaining orders even as rivals fail. C&Heavy Industries Co., a South Korea shipbuilder that has yet to deliver its first vessel, is seeking protection from creditors to avoid bankruptcy. Orders for new vessels, which take as long as three years to build, slowed 42 percent in the first 11 months of 2008 as world trade slumped, hurting small and new yards. About 30 percent of Chinese orders won in 2007 were canceled, said Cho In Karp, an analyst at Good Morning Shinhan Securities Co. in Seoul. About half of the 30 shipbuilders in South Korea may close or move into another business, he said. ?Everyone seems to agree that it"ll be tough? through the first half of 2009, Kim Tae Hoon, vice president of Hanjin Shipping Co. said in Seoul. ?We are hoping the market will start to pick up slowly from the second half. ?